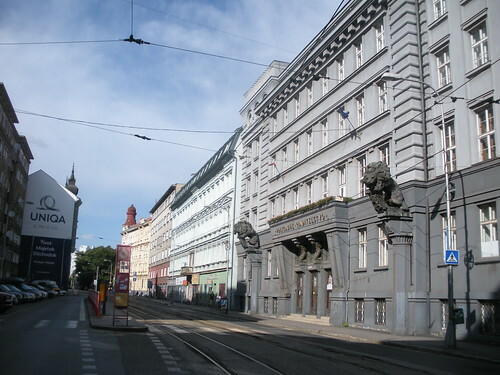 It took us ages to extricate ourselves from Vienna which we did by taking the industrial tour, and then receiving assistance from a woman, aged probably in her 70s, who led us to the Donauradweg. The bicycle path took us past an area that’s popular for Viennese nudists who were stripping off to lie in the sun. Then along a long dike with forest on both sides. 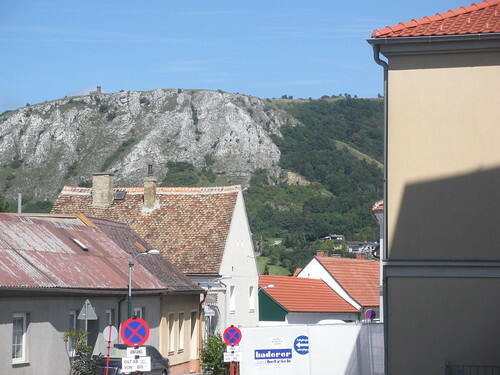 Our last Austrian town was Hainburg with Roman ruins and fort on the hill top. We could see Bratislava in the distance and crossed into Slovakia past the now disused border post. So we have arrived in eastern Europe. It is a distinctively different place from its neighbour. There was not time to become closely acquainted with Bratislava, but we stopped for a drink in the central mall and then began another gritty tour through high rise suburbs, then low rise outskirts and countryside that featured chemical factories, bad roads and dumped rubbish. Eventually we made our way back to the Donau, now a vast expanse with wetlands and recreational beaches, people fishing, roller blading, cycling and picnicking. We had to find a place to stay so left the path to go into the town of Samorin. It has many blocks of flats, the old town centre a little neglected and lacking the charm that we are accustomed to. There were no tourist facilities or accommodation at all, so we returned to the river which does have these things. Our pension in Cilistov was comfortable and we dined at the Hotel Kormoran. This area is called the Riviera. This entry was posted on 15 August 2010 at 7:29 am and is filed under Austria, Slovakia. You can follow any responses to this entry through the RSS 2.0 feed. You can leave a response, or trackback from your own site.